It’s finally happened! 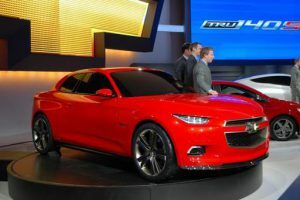 To many car enthusiasts chagrin, Chevrolet has decided to put the 2020 Camaro on a front wheel drive, hybrid platform. In a co-sponsored project with Kia, the new Camaro will shift it’s image to a sporty but fuel efficient theme. This new move is driven by increasingly tougher governmental standards resulting in very stiff Gas Guzzler taxes on many performance models. GM has decided to reserve these Gas Guzzler taxes only for their line of trucks and the Corvette. The new platform will coincide with a broad based marketing push to make the Camaro more appealing to hybrid owners that would like a little more of a bad boy image. Accoutrements for this new platform will include a heated steering wheel, heated seats, theatre interior lighting, and automatic parking assist for parallel parking. The top of the line model will come with 235 – 50 R 17 tires with U rated rubber capable of a whopping 124 mph. Powder blue painted aluminum rims are an option. The power plant will provide a respectable 289 horsepower at the wheels while maintaining 37 mpg on the highway. The pony car will still handle well. Recent testing resulted in the car pulling 0.79 g on the skid pad. The press release was timed specifically for this weekend because Sunday is April Fools Day. haha….HAPPY APRIL’S FOOL DAY TO YOU TOO !